Support, advice, ideas and inspiration to help Independent Retailers to get and stay OPEN for business. Home to the Independent Retailer Month & Independent Christmas campaigns as well as host of the Independent Shops directory. Call us on 01727 238890. Amanda Ruiz, founder of Promote Your Shop has launched her retail marketing consultancy this month and has hit the ground running as she is the Local Activation Partner for the Indie Easter Egg Hunt in her adopted town of Colchester, Essex. 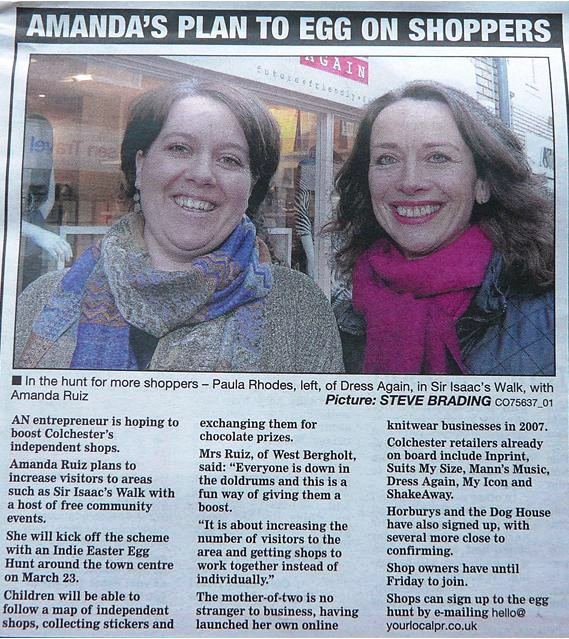 Boosting the confidence of Independent Retailers with the Indie Easter Egg Hunt! In the lead up to the launch of Promote Your Shop, Amanda has been conducting face to face surveys (they are still open to complete: see http://www.surveymonkey.com/s/7B58SLW ) with retailers, asking them how their approach to marketing, social media and promotions is working. She communicated the initial findings to Clare Rayner – approximately 65% of the respondents did not have a marketing plan and mostly relied on word of mouth for trade. Amanda also found that there is a certain sense of resignation in the attitudes of some shops, so, to try to turn that around, Clare invited Amanda to boost the confidence and attitudes of the independent retailers in Colchester by becoming the local activation partner for the “Enjoy an Independent Easter” campaign and getting the Easter egg hunt up and running there. The campaign’s purpose is to drive more footfall to the local shops. In Colchester, due to sponsorship for printing, the cost to each retailer was only £21 – which included artwork and the chocolate eggs (prizes for all those who complete the hunt). Amanda recruited retailers by walking the streets of Colchester and inviting the shop owners to sign up. The local newspaper also put out a ‘call to arms’ piece (twice) to appeal for any interested retailers. You’d think it would have been a no-brainer, but surprisingly given the state of the economy, and the fact that the local council have a new scheme in place banning cars from accessing Colchester high street which was feared to reduce footfall, several shops that Amanda approached declined to take part… However plenty did take her up on the opportunity, and are reaping the rewards! The initial meeting to brief the 24 retailers about the event was such a success that the retailers requested monthly meet ups to network, share ideas and partner up! Braintree Community Hospital kindly sponsored the printing and distribution of 20,000 maps, an incredible amount! Amanda went to the printing factory to press pass the maps and took a video so people can see the interesting print process. Also on the first day of the event, in horrendous weather, a video was taken (by mistake) of the group shot for a press call, but it makes and excellent living photo! See here. So Amanda’s approach has truly been wide reaching and all that is hoped is that the excellent campaign does drive the traffic to the shops. Initial results show that even in freezing snow conditions, and within 3 hours from the start of the event, approximately 10 certificates had already been awarded and new sales had been made! This is truly an impressive outcome, but it’s not unique – that’s what’s so incredibly positive about the Independent Easter campaign – Colchester’s success is replicated in Oadby, Exeter, Midhurt and Letchworth, to name a few. Finger crossed that the independent retailers involved in all 56 towns UK-wide can report similar positive news! This entry was posted in Independent Easter, Supporting Independent Retail. Bookmark the permalink.